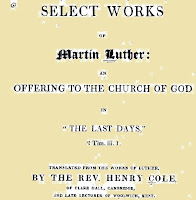 Beggars All: Reformation And Apologetics: Select Works of Martin Luther: an Offering to the Church of God in "the Last Days"
There have been smaller English collections of Luther's writings published, now available free on-line. 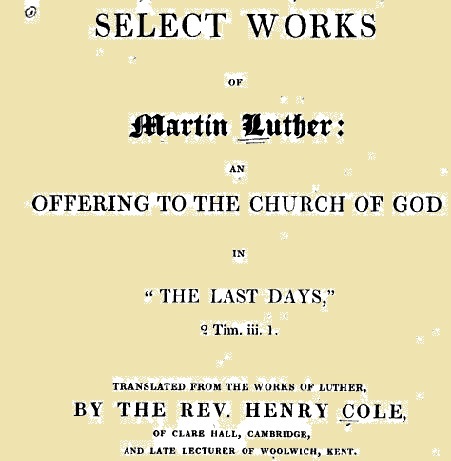 One such collection was a four-volume set put out by the Reverend Henry Cole (1792-1858): Select works of Martin Luther: an offering to the church of God in "the last days". Three of the volumes were easy to locate (but volume four was problematic, Google titled it incorrectly). These books are available for purchase as reprints. The original printings can be expensive. Selections from the Commentaries on the Romans, Galatians, Psalms, etc.